This paper examines the discrepancies between phases of research into an emerging small-scale ethnic group in the UK. Whilst top level indications using large-scale survey data produced sociologically relevant findings about the group it was not until the analysis of subsequent qualitative interview data that a more comprehensive picture emerged. Links between ethnicity and social exclusion are demonstrably strong, particularly in areas of disadvantage (Sanchez-Perez, Morales and Jansa, 2005) and the Cornish potentially represent just such a case. Initial quantitative analyses of primary and secondary survey data indicated little significant link between ethnic group affiliation and social exclusion factors. However a more interesting discrepancy between the belief of exclusion and the reality emerged during a stage of qualitative interviews. This paper contributes to the literature critical of methodological exclusivism and towards triangulated, mixed methodologies. 1.1 The results reported in this paper form part of a larger project seeking to explore the links between ethnic group affiliation and social exclusion in Cornwall, a county in the south-west of England, UK (see Figure 1). The Cornish have long felt a 'persistent sense of difference' from others in the same geographic region (Payton 1992) and, in recent years, there has been a rise in those wishing to legitimate the group as a distinct ethnic identity (see for example Cornish Constitutional Convention, 2002). Certainly there has been a sharp increase in the inclusion of a Cornish category in official ethnic monitoring, as well as a steady rise in academic research examining the long-term population (for a succinct summary see Williams, 2002). 1.2 Whilst it is not the purpose of this paper to argue a case for or against the Cornish as a distinct group (something rigorously examined elsewhere (Husk, 2011; Payton, 1997); the application of a pragmatic model of an ethnie (suggested by Smith, 1988) demonstrates the deep cultural and symbolical differences which exist. Recognition of the group has been problematic, at least in terms of state legitimation, despite the strong linguistic and political differences historically well documented in the press. Strong nationalist movements in the region have long fought for a more substantial boundary separating the Cornish and non-Cornish across both territorial and cultural spheres (Cornish Constitutional Convention, 2002). 1.3 A move in 2009 to a Unitary Council for the county went some way to recognising these differences and, whilst there are subtle arguments underpinning the Cornish case for a distinct ethnic identity, whatever definition one uses there is a strong case for classification. The limited studies examining the group often report Cornish ethnicity levels of around one quarter of the total population (see for example Cornwall Strategic Partnership, 2007). The impassioned debates around the legitimacy, control and management of a Cornish identity (Burton, 1997; Deacon and German 1999; Hale, 2001), are, for the purposes of the current article, summarised as broadly legitimating the group. 1.4 There are more general methodological concerns around the measurement and validity of ethnic categories which are somewhat problematic for research such as this. Increasingly there are calls for change; ranging from those seeking a radical re-examination of ethnicity measurement (Burton, Nandi and Platt, 2000; Simpson and Akinwale, 2007), to its abolition altogether (Carter and Fenton, 2009). The problematic nature of valid ethnic constructs will be returned to in later sections, but the measurements described in this article adhere to a pragmatic mid-point, and focus on the ascription of cultural characteristics by both insiders and outsiders. Inclusion of a Cornish identity, in these data, was returned if an individual self-identified as such. 1.5 The emergence of a Cornish ethnie raises significant questions about the size and relative position of the group. The literature on indigenous deprivation is both extensive and coherent (see Eversole, 2005; Feldmayer, 2010), often linking ethnic group affiliation in regions of disadvantage to higher levels of social exclusion (Garreta-Bochaca, 2006; Tanton et al. 2010; Bygren and Szulkin, 2010). That Cornwall is an area of some disadvantage is well documented; low qualification levels and high unemployment are both contributors to, and products of, a low Gross Domestic Product (GDP). Cornwall was one of only four areas in the UK to receive 'Objective One' funding (and subsequent 'Convergence' funding) through the European Union Structural Funds; allocated to areas with less than 75% of the national GDP (Gripaios and McVittie, 2003). 1.6 The county also exhibits other, more geographically specific, deprivation characteristics linked to the rise in both tourism and in-migration; the region remains poor despite these influxes and the local population is therefore at risk of relative deprivation (Griffiths, 1989; Williams, 2003). These risks, combined with a lack of direct research in the field make a targeted examination of the Cornish as a group both timely and important. The first stage of any such examination was the collation of all data referring to the Cornish population directly, in order to assess the scale of any linkage. 1.7 Whilst there has been a rise in the inclusion of Cornish categories in ethnic monitoring, the delivery of these instruments was often not suitable for widespread generalisation. Included in the 2001 England and Wales Census was, for the first time, a coded category whereby an option was provided to 'write-in' a Cornish ethnic identity. These data therefore represent the largest and most comprehensive data set relating to the group (Office for National Statistics, 2009a). Despite this, the variable included in the Census lacked a dedicated 'tick-box' option and so the figures, whilst representative of those individuals who selected the option, are likely to under-estimate the true population (Office for National Statistics, 2009b). 1.8 The broad aim of the project described here was to analyse, adjust and extend these Census figures to gain a more detailed picture of the Cornish, as well as to assess the levels of social exclusion they potentially experienced. 'Social exclusion' in this instance was operationalised using the Bristol Social Exclusion Matrix (B-SEM) described by Levitas et al. (2007). There are as many debates around this operationalization as around ethnicity measurement and, whilst by no means a perfect measure, the matrix is argued to be indicative of the current literature on exclusion measurement. 2.1 Three main stages of research were undertaken to address these issues, and it is the complex interplay between the results at each stage which represents the central thesis of this article. Whilst the quantitative analyses conducted utilising the Census data (as well as the primary postal survey data) revealed a subtle interplay between variables, the underlying processes did not emerge until the final phase of analysis. The next sections will briefly outline the quantitative results before examining the subsequent emergent qualities in the interview data. 2.2 The 'write-in' nature of the Census variable meant that only those individuals who took the time, and were aware of the option, selected the category. Such individuals potentially biased the sample in favour of those with a heightened sense of ethnic identity, those from non-manual occupations and with higher levels of qualifications (Hickman and Walter, 1997). Thus, firstly, all other data referring to the Cornish were trawled in an effort to derive weights to improve the Census estimates. The weighting process itself was derived largely from statistical aggregation with some corrections made for variances in the data sets; these were then applied to the raw data in order to estimate the Cornish population more accurately. The results of this re-analysis upped an original estimate in the Census of 33,932 (6.7%), to between 145,000 and 155,000 (28% to 30%) individuals. These synthesised Census data were then analysed for statistically significant links with social exclusion variables, as identified using the Bristol Social Exclusion Matrix (B-SEM) (Levitas et al. 2007). 2.3 Secondly, the results of this re-analysis formed the basis for hypotheses tested using a postal survey, administered to two large geographic areas of Cornwall. A western and eastern set of Census wards were sampled, totalling a population of 250,000, with 3,000 addresses selected for inclusion. A response rate of 27.5% meant a total number of responses for analysis of 824. The instrument variables were derived wholly from the B-SEM matrix described, each element of the matrix being included across one or more variables. Also included was a modified ethnicity variable from the 2001 Census, with the addition of a 'Cornish' tick-box option. These data were analysed in SPSS using correlation, multiple linear and multi-level regression techniques; the analyses were also run after multiple imputation of synthesised elements to account for missing data. 2.4 In keeping with the mainstream literature on the experience of indigenous groups in areas of disadvantage, there had been hints in the somewhat limited literature that the long-term population of Cornwall experienced key exclusion variables differently (Thornton, 1996; Williams, 1995). These hypotheses were logically founded: Cornwall is certainly an area with pockets of disadvantage (Cornwall Council, 2010; South West Observatory, 2011) and as discussed above the links with ethnicity were credible. 2.5 A preliminary examination of the un-weighted Census data (sourced from the Office for National Statistics, 2010) showed that there was some evidence of a link between Cornish ethnic affiliation and social exclusion. There were statistically significant differences between the Cornish and non-Cornish populations across key variables such as employment, housing and education (see Table 1). A bi-modal distribution of the results also hinted at the presence of a so-called Cornish 'intelligentsia' (Rapoport and Lomsky-Feder, 2002), with both lower and upper brackets exhibiting differences. The application of the derived weights strengthened the statistical significance of these results as well as resulting in the emergence of other significant variables. More detailed analyses were not undertaken due to the aggregate nature of the existing Census data, the commissioning of further data was also not deemed suitable for such an exploratory phase. Indeed the strict limitations imposed on secondary data analysis in general (see Hofferth, 2005; Kielcolt and Nathan, 1985) impacted heavily on the strength of the conclusions at this stage. 2.6 However, hypotheses generated from the secondary data informed the analysis of the primary survey, with models constructed reflecting the variables across which the two populations had displayed significant differences. Correlation analysis of these data showed that Cornish ethnic group affiliation was significantly associated with the constructed social exclusion index (rs=.115, p>0.05); though the relationship was weak and explained little variance. What was beginning to emerge from both sets of data was the complex interplay between ethnicity, exclusion and other key variables in the Cornish context. 2.7 Multiple linear regression analysis of the survey results revealed the limited impact Cornish ethnicity had on the dependent variable (exclusion index; b=1.567, t=2.650, p>0.05). Whilst the predictors overall were significant (r=.416), and the model met all necessary statistical assumptions (dw=1.95; F=7.71); the results indicated that the impact Cornish ethnicity had on the dependent was minimal. Multi-level regression analysis confirmed that the relationships between the significant independents and the exclusion index did not vary by ethnic group. In order to eliminate the somewhat problematic nature of missing data (particularly acute in dependent variables consisting of complex indices) the analyses were re-run after a phase of multiple imputation, however these synthesised data returned no significant differences from the raw analysis. 2.8 The results of the quantitative stages examining the Cornish, both secondary analysis of the 2001 Census data and the postal survey results, demonstrated a complex relationship between ethnic group affiliation and exclusion experience in Cornwall. There were more explanatory factors for exclusion over and above ethnicity (income for example), and the phases demonstrated the lack of causal explanation present in statistical linkage. Whilst there was clearly some level of association in keeping with the literature, the low levels of variance explained led to the logical assumption that there was a discrepancy between the perceived and actual levels of exclusion felt by the group. 3.1 The hypothesis forwarded in the academic and popular press, of a group exposed to increased levels of social exclusion linked directly to ethnic group affiliation, was not wholly supported by the findings of the first two stages. In order to better address these issues a level of qualitative data collection was necessary: the mutually supportive nature of the previous findings was not in question but, rather, the underlying story behind the somewhat incongruous result. 3.2 The mixing of traditional methodologies is indicative of the rise in pragmatic, problem based approaches to research questions which has developed in the 'post-paradigm wars' (Williams and Vog,t 2011: 4). Not only are methodologies combined to explore, in greater depth, the phenomenon under scrutiny but innovative analyses are emerging which use combination at later stages of the research process (see for a good summary of the current position of mixed methodologies Creswell, 2007; Onwuegbuzie, Leech and Collins, 2011). Certainly social research terminology has moved away from traditional breakdowns of method and towards critiques of methodological exclusivism (Brent and Kraska, 2010). Whilst it is not within the scope of this article to examine this wide ranging literature, it is the purpose to highlight the emergence of an underlying story of Cornish disadvantage which would have remained hidden without a mixed methodological approach. 3.3 The utilisation of any combination of methods and analyses naturally reveals more of the subject under scrutiny, though of course multiplying the limitations (Fielding, 2009). In the current project these limitations were outweighed by the exploratory nature of the subject material. More generalisable results from previous phases had showed the broad-scale linkage, however the underlying complexities remained hidden. Did the Cornish (or other groups) feel that they were often excluded to a greater extent than other groups in the same community? Was this exclusion in any sense real; was it something that those in already deprived communities were aware of in the same way that other BME (black and minority ethnic) groups were? These topics were put to seven respondents through face-to-face interviews, generally lasting around 30 minutes (Moustakas, 1994); resulting in a total of 3.5 hours of data for analysis. 3.5 These data were analysed in NVivo8 using the five step procedure identified by Moustakas (1994) and Creswell (2007). The analysis involved the identification of significant statements by the respondents and the collation into coherent themes for descriptive and contextual analysis; through these stages the 'essence of the phenomenon' under scrutiny was developed (Creswell, 2007: 62). Alongside these results there were a number of tangential issues which emerged relating largely to funding streams in the county. The respondents were consistent and mutually coherent on the issue of Cornish ethnicity and social exclusion. 3.6 All of the respondents agreed that there were significant levels of social exclusion in Cornwall, ranging from unemployment through to alcohol and drug use/misuse; the levels of alcohol use were consistent with the pattern of other rural areas (DeHaan and Boljevac, 2010). The respondents reported no breakdown of exclusion variables by either geography or ethnic group, and, in keeping with the previous survey analyses, reported a complex interplay between employment, income and benefit allowance. 3.7 Again in agreement with the findings of the previous stages, the respondents reported that the Cornish were a numerous and fiercely proud group in the area; though affiliation to the group (in any form) was not thought to impact significantly on lived experience. The respondents almost universally reported a belief amongst the Cornish of relative deprivation and two main hypotheses were posited. These firstly focused on the relative wealth of incoming migrants and, secondly, the attitudinal positions of the long-term residents (something observed previously by Bosworth and Willett, 2011). The low aspirations and often low self-esteem felt by the Cornish were, argued the respondents, partly due to the attitudes of deprivation harboured by the group: '�in truth some people do it to themselves' (Respondent 005). 3.8 This belief of deprivation was constructed across two main areas; firstly, the Cornish were described as an insular group reluctant to move geographic area. It was hypothesised that this insularity essentially contributed to a lack of aspiration and, eventually, to low self-esteem. Secondly, the relative wealth of in-migrants was assessed and it was felt that because these individuals were often affluent (i.e. they had the cultural and material capital to be geographically and socially mobile) the Cornish perceived relative deprivation more acutely (see again Bosworth and Willett, 2011). Attitudinally this was compounded by the fact that many Cornish individuals held the belief that there was a 'special right' for the group, entitling them to benefits in the region. Such a belief (a right for the Cornish in the County and the relative wealth of some in-migrants) led, in this particular instance, to reduced levels of aspiration amongst the Cornish. 3.9 Another explanatory factor in this belief of disadvantage, and why it may differ from the reality, was suggested to be the composition of some of the areas under scrutiny. Some geographic areas, particularly in the west of the county, consisted predominantly of Cornish residents; where there was deprivation there was almost always Cornish individuals or familial groups, any distinction between ubiquitous deprivation and relative disadvantage was made problematic. The respondents argued that in some of the areas researched everyone was socially excluded, and the very fact that a number of the residents were Cornish meant that, logically, there were Cornish groups who were excluded. Such a linkage was not necessarily an indication of a direct link between ethnic group affiliation and social exclusion. The interviewees all recognised a discrepancy existed between the belief of exclusion experienced by the Cornish and the reality, whilst in all areas there were significant levels of exclusion there was no split between ethnic groups. 4.1 The small, but coherent, literature around perceived discrimination supports the discrepancy which emerged from the three stages of research discussed. Belief of exclusion in the face of a differing reality is not unique to the Cornish situation. The necessarily complex processes which drive unfounded and perceived discrimination are by no means comprehensively understood, however a number of relevant hypotheses are applicable to the Cornish case. 4.2 Most fittingly, the discrepancy between 'at-group' discrimination and personal experience is embodied by the personal versus group discrepancy (PGDD) hypothesis forwarded by Taylor et al. (1990). There is significant evidence reporting the PGDD phenomenon across a wide range of variables and the results indicate that variance is often dependent on a key set of factors (Operario and Fiske, 2001). Firstly, strength of group affiliation is linked to group discrimination perception; those with higher levels of affiliation perceive greater at-group prejudice (Verkuyten, 2002). This is underpinned by allocentric behaviour; or the individual-level collectivism present in minority and majority ethnic groups. More generally, a highly allocentric individual will identify strongly with cultural markers and therefore be likely to experience a heightened awareness, and sensitivity, to group information. Allocentric processes are not uni-directional or single-dimensional, with data indicating a perception of discrimination often lower than reality. Sipe (2009) for example, reported the attitudes of young people in university towards gender discrimination in the workplace, with the results reflecting an unfounded belief in a gender neutral workplace. 4.3 Running concurrently to individual allocentric behaviour are macro-processes such as media representation, which frequently corroborate the sensitivity experienced by highly affiliated individuals. Thus 'the value of the representations of inequality lies not in what they describe, but what they provoke' (Reygadas, 2005: 501). Images portrayed in various media are often simplified representations of a 'kernel of truth' which underlie them, frequently referring to historical events for validation. The impact of these images on both the individual as well as the collective consciousness should not be underestimated. 4.4 In practical terms the French riots of 2005 argues Skrobanek (2009), represent a very real application of these PGDD processes in action. The rioters contained a large proportion of second and third generation immigrants and the central focus for research should have been the causal processes which made these individuals re-ethnicise. This re-ethnicisation occurs, according to Skrobanek, during periods of widespread perception of minority group discrimination and due to majority group boundaries appearing less-permeable. Under such circumstances group affiliative bonds become strengthened and the individual retreats further into a particular cultural identity. 4.5 Any impacts are not merely perceptive or information based; it has been well demonstrated that false beliefs are often manifested as real behaviour (Geraerts et al. 2008). A false memory about a food related illness for example, can produce a significant belief amongst participants in the validity of the memory. The participants in this example also frequently developed action based on the false memory; avoidance of the particular food group utilised in the experiment (Geraerts et al. 2008). 4.6 Social effects have an equal impact on the individual in PGDD cases when compared to psychological ones, concrete implications have been reported linking perceived discrimination and self-reported health variables (Jasinskaja-Lahti et al. 2007; Mohensi and Lindstrom, 2008). Even when controlling for other demographic factors, there is still strong evidence of a significant relationship between individuals anticipating discrimination and reporting poor health levels: the relationship is also more frequently found in minority ethnic groups. 4.8 The reality of this attitudinally orientated action (and the PGDD process more generally) is such that techniques have been developed which incorporate the theory into inclusion models. Suckling et al. (2009) utilised beliefs, barriers and control models (BBaC) to assess the success of inclusion projects in deprived areas of the UK. By assessing beliefs (the perceptions of providers), barriers (the perceived obstacles) and controls (the overcoming techniques) their results were used to plan and develop strategies for inclusion projects. 4.9 The PGDD processes in the Cornish context are likely to be made more complex or mutually supported by the uniqueness of the rural situation and therefore cannot be seen in isolation. Whilst the impact of rurality is often negated in social exclusion research, the characteristics are widespread (Commins, 2004). Rural factors are often subtle and therefore harder to operationalise even for those affected, so individuals experience personal failure as causal for deprivation rather than structural factors (Richardson, 2000; Shucksmith and Chapman, 1998). 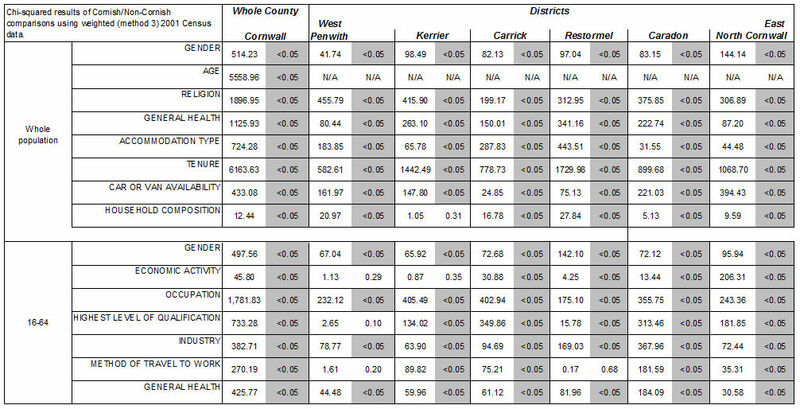 The polarisation in the current data referring to the Cornish could be indicative of exactly this situation; whereby rural geography creates both increased numbers of affluent and deprived individuals. 4.10 In a rural setting political and cultural power arguably operates in more complex ways, potentially limiting the access which individuals have to cultural capital (Shubin, 2010). Coupled with the discrepancy more generally between the rural idyll and the reality, an acute sense of difference can be manifest in very real health, housing, transport and poverty issues (see, respectively, Cloke, Millbourne and Widdowfield, 2001; Gray, Shaw and Farrington, 2006; Wickrama, Elder and Abraham, 2007). Rural deprivation broken down along ethnic lines is a point of contention within the literature; the levels of an ethnic minority population are often small, though there is some evidence linking the two (see Holloway, 2007). 4.11 These theoretical models indicate that the Cornish situation is not a surprising one sociologically; the group appear to display characteristics reminiscent of the perceived discrimination literature; high perceived levels of at-group discrimination alongside relatively low levels of reported individual discrimination. An application of the models of the underlying processes also fit these data; with strong levels of group affiliation and, additionally, high levels of collectivism at the individual level. The literature would therefore point to hyper-sensitivity about any group orientated information as being especially discriminatory for the highly affiliated individual. Simply, Cornish individuals are potentially highly tuned to any group level discrimination and perceive group deprivation whilst experiencing limited exclusion themselves. 4.12 Whilst cognitive information processing factors cannot be ignored (there are numerically more data for 'the Cornish' than there are for any single individual) cross-cutting issues of class orientated action potentially have an impact. Lower-class individuals act differently in interactions with upper-class individuals, though such behaviour is moderated when the two groups are both members of a numerical minority (Garcia, 2007). It is entirely possible that in this case class action serves to strengthen rather than weaken group affiliation, and subsequently hyper-sensitivity to Cornish issues. 4.14 Portrayals in this vein serve as positive feedback loops within the PGDD process and create a constant re-ethnicisation of otherwise moderate individuals. The representations in the Cornish case are not solely at group level, and the portrayal of both housing estate individuals alongside the popularised rural idyll has an impact (Dean and Hastings, 2000; Phillips, Fish and Agg, 2001). 4.15 Such an effect on individuals is not limited to those within the group experiencing hyper-sensitivity, and could explain the small amount of difference recorded between the Cornish and non-Cornish populations in the quantitative data. False historical memories coupled with anticipated discrimination prevalent in even a small section of the group have been linked to increased social exclusion scores (Jasinskaja-Lahti et al. 2007; Mohensi and Lindstrom, 2008). 4.16 Whilst not definitive or unique, the coherent story which emerges from the qualitative phase of this research was certainly inaccessible through the preceding two stages of quantitative data analysis. These results do not, or are not intended to form the basis of an argument for or against particular methodologies; however the benefits of an approach set against methodological exclusivism are clear (Brent and Kraska, 2010). The somewhat complex underlying processes driving the discrepancy between the belief and reality of relative exclusion amongst the Cornish in Cornwall became coherent only after analyses which examined top-level macro forces alongside richer and more detailed data. 4.17 It must be recognised that the hypotheses generated in the three stages of research remain tentative for a number of methodological reasons. The emergence of a PGDD/rurality process at the final stage necessarily implies that there was no testing within large-scale data; no specific variable in the primary survey was included. The associated and inherent limitations, with both the quantitative phases and the numerically small sample in the final phase, limit the generalisability of the findings to wider areas of Cornwall. However as an exploratory study with some tentative broader applicability the findings have sociologically relevant implications, as well as representing a first direct examination of the group. 4.18 The three-stage emergence of complex Cornish issues therefore contributes, in a small way, to the evidence in support of methodological pluralism. Older, more traditional divides in the social research methodological literature have, as has been stated, been replaced by innovations in the mixing of the design, collection and analyses of multiple data types (see Williams and Vogt, 2011). British Sociology in particular has seen a distinct rise in the utilisation of methods most applicable for the situation; though as Payne, Williams and Chamberlain (2004) have argued; there is a need for the discipline as a whole to move towards a more inclusive approach. 4.19 Innovations in both epistemology and method are often not reflected in the analysis of particular topics and this lack of 'genuine plurality' (Ibid 2004: 161) limits the knowledge gathering process. The triangulation of the current problem not only lends validity to the tentative conclusions drawn in this instance, but also enables the coherent development of hypotheses for future research to address. The Cornish case is far from closed and, indeed, the phenomena may well develop into something more complex, however a more multi-dimensional methodological process has demonstrated the ability to gather more, and more complex information where previously only hints had been reported. 5.1 The conclusions drawn from these data and the arguments set out above fall into two categories, the methodological and the substantive. The Cornish are certainly a complex case, with no straightforward links between group affiliation and social exclusion factors in the county. At a macro-level, there was no strong evidence to suggest that the group were disadvantaged, yet in the literature (and the popular press) there had long been a belief in such a link. Qualitative analysis revealed this discrepancy as not only real but significant, and, as such, the main focus of sociological interest became the reasons for this discrepancy. 5.2 Substantively, this article argued that the Cornish represent an example of the PGDD processes described by Taylor et al., underpinned by a distinctly rural setting: hyper-sensitivity to group information alongside low levels of individual exclusion. This represents a development in the knowledge of the Cornish in particular, as well as having relevance for other small-scale emergent ethnic groups; which in an increasingly fragmented UK are becoming ever more frequent. The popular perceptions around these groups must be rigorously and continuously examined. 5.3 Methodologically, the emergence of a highly descriptive phenomenon in this instance lends weight, however slight, to the arguments for methodological pluralism. The constant swing between qualitative and quantitative paradigms on a disciplinary level serves only to muddy the waters of social research; and the findings of the particular case here agree entirely with the arguments for genuine post-paradigm plurality; something increasingly popular in the British context. 1Smith (1988), in his 'The Ethnic origin of Nations', explores the characteristics which constitute an ethnic group, or ethnie. Whilst by no means a perfect model the six identified features are often utilised as a framework for exploring the literature on small scale groups. Smith's position is also indicative of the approach taken in this research regarding the self-ascription of ethnic status by individuals. 2The B-SEM matrix was formulated in an attempt to review existing sources on social exclusion and devise a model for both explanatory and variable identification purposes. 3Unlike other attempts to improve upon a suspected undercount in a population Census, in this case there was no opportunity to utilise more complex methods such as multiple imputation or contextual analysis. This was largely due to the fact that there was only a single variable to weight, alongside severely limited data with which to derive such a weight. What was needed therefore was a method to collate multiple data sets in order to derive a more accurate estimate of the population of the Cornish in Cornwall. The first method of collation was a simple aggregated mean of the other data sets. The second method included a term for the sample size of each study, a weighted average for each category which was weighted according to the numbers in each category. The third method included a term to account for the precision and variance of the observations, giving a two term equation with which to examine individual results. 4The B-SEM matrix covers three key areas of exclusion, further broken down into ten identifiable groupings for variable identification. The three key areas are: resources; participation; and quality of life. 'Resources' is broken down into, material; access to public; and social resources. 'Participation' is split into, economic; social; culture/education; and political participation. 'Quality of Life' is split into, health; living environment and crime. 5This discrepancy, noted by Taylor et al. (1990), highlights the high levels of 'at-group' discrimination reported by some members of a group who experience little or no 'at-individual' discrimination themselves. BERG, B. (1989). Qualitative research methods for the social sciences. (5th ed.) London: Pearson. BURTON, R. (1997). A passion to exist: cultural hegemony and the roots of Cornish identity. In P.Payton (Ed. ), Cornish Studies Five (pp. 151-163). Redruth: Institute of Cornish Studies. CORNISH CONSTITUTIONAL CONVENTION (2002). Devolution for one and all; governance for Cornwall in the 21st Century. Truro: Cornish Constitutional Convention. CORNWALL COUNCIL (2010). Understanding Cornwall 2009-2010 - big messages. Truro: Cornwall Council. CORNWALL STRATEGIC PARTNERSHIP (2007). Quality of life tracker survey. Truro: Cornwall Council. CRESWELL, J. (2007). Qualitative inquiry and research design; choosing among five approaches. London: Sage. DEACON, B. & GERMAN, J. (1999). Cornish National Minority Report [Online] http://www.geecee.co.uk/CNMR/contents.htm (Accessed 5/10/08) [On-line]. DEAN, J. & HASTINGS, A. (2000). Challenging images. Housing estates, stigma and regeneration. Bristol: Policy. EVERSOLE, R. (2005). Overview-patterns of indigenous disadvantage worldwide. In R. Eversole, J. McNeish, & A. Cimadamore (Eds. ), Indigenous peoples and poverty; an international perspective. (pp. 29-37). London: Zed. GRIFFITHS, A. (1989). Change in the countryside, the Cornish perspective. A study of twelve rural parishes in Cornwall. Exeter: Cornwall Rural Development Committee. HICKMAN, M & WALTER, B. (1997). Discrimination and the Irish community in Britain; a report of research undertaken for the Commission for Racial Equality. London: Commission for Racial Equality. KIECOLT, K. & NATHAN, L. (1985). Secondary analysis of survey data. London: Sage. LEVITAS, R., PANTAZIS, C., FAHMY, E., GORDON, D., LLOYD, E., & PATSIOS, D. (2007). The multi-dimensional analysis of social exclusion [Online]. <http://www.cabinetoffice.gov.uk/social_exclusion_task_force/publications/multidimensional.aspx> (accessed 21/4/2009) [On-line]. OFFICE FOR NATIONAL STATISTICS (2009a). Information paper: deciding which tick-boxes to add to the ethnic group question in the 2011 England and Wales Census. London: Office for National Statistics. OFFICE FOR NATIONAL STATISTICS (2009b). Final recommended questions for the 2011 Census in England and Wales. National Identity. London: Office for National Statistics. OFFICE FOR NATIONAL STATISTICS. (2010). 2001 Census; Standard Area Statistics (England and Wales) [Computer file]. ESRC/JISC Census Programme, Census Dissemination Unit, Mimas (University of Manchester). ONWUEGBUZIE, A., LEECH, N. & COLLINS, K. (2011). 'Toward a new era for conducting mixed analyses: the role of quantitative dominant and qualitative dominant crossover mixed analyses'. In M. Williams and W.P. Vogt (eds. ), The Sage Handbook of Innovation in Social Research Methods. London: Sage. PAYTON, P. (1992). The making of modern Cornwall. Redruth: Dyllansow Truran. PAYTON, P. (1997). Cornwall in context: the new Cornish historiography. In P. Payton (Ed. ), Cornish Studies Five (pp. 9-20). Redruth: Institute of Cornish Studies. SCHUTZ, A. (1967). The phenomenology of the social world. Illinois: Northwestern University Press. SIMPSON, L. & AKINWALE, B. (2007). Quantifying stability and change in ethnic groups. Journal of Official Statistics, 23. 2, 185-208. SMITH, A. D. (1988). The Ethnic Origins of Nations. Oxford: Blackwell. SOUTH WEST OBSERVATORY (2011). State of the South West 2011 Taunton: SWO. THORNTON, P. (1996). Second homes in Cornwall. In P. Payton (Ed. ), Cornish Studies Four (pp. 152-157). Redruth: Institute of Cornish Studies. WILLIAMS, M. & HARRISON, E. (1995). Movers and Stayers: A comparison of migratory and non-migratory groups in Cornwall, 1981-91. In P. Payton (Ed. ), Cornish Studies Three (pp. 176-193). Redruth: Institute of Cornish Studies. WILLIAMS, M. (2002). The new Cornish social science. In P. Payton (Ed. ), Cornish Studies Ten (pp. 44-66). Redruth: Institute of Cornish Studies.